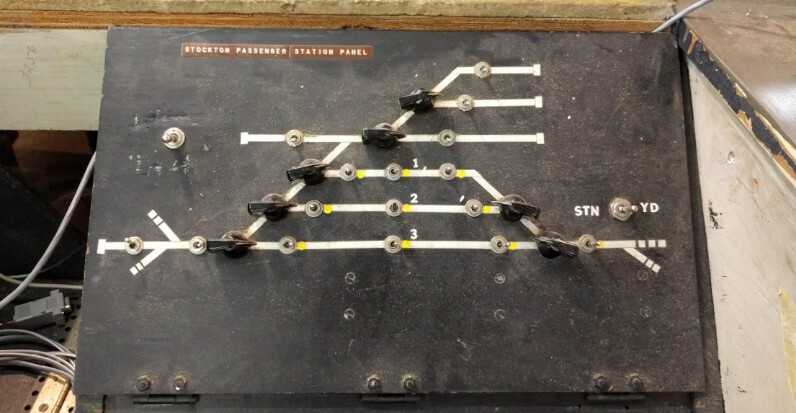 The corresponding panel for the station and its inner workings below. Each block power selector has two choices: yellow dot on the right for DCC mode and left side for DC, from what I was told. There’s no DC left on the layout so that side goes to… I don’t know where. So where does the DCC come from? Which booster? A quick test shows it comes from the Stockton Yard power district. Writing on the support is “Relays E / W”. East / West makes sense. East is on the right side of the station, and West is on the left side. The “E” power lead is controlled by that double relay (top picture). The output is neatly labeled “Power to STN Panel Eastside”. 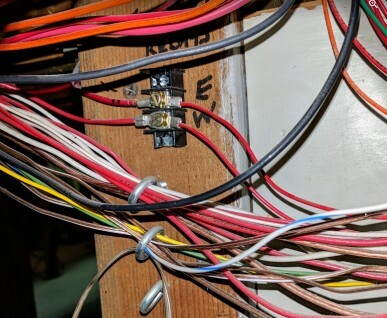 So at least I got the right lead wire. Schema indicates this is controlled by the “STN/YD Relay” which can be found in the middle picture. Power & control of that relay then goes into adjacent terminal blocks. All these match the extensive and very well drawn schematics left by Mr. Perry. 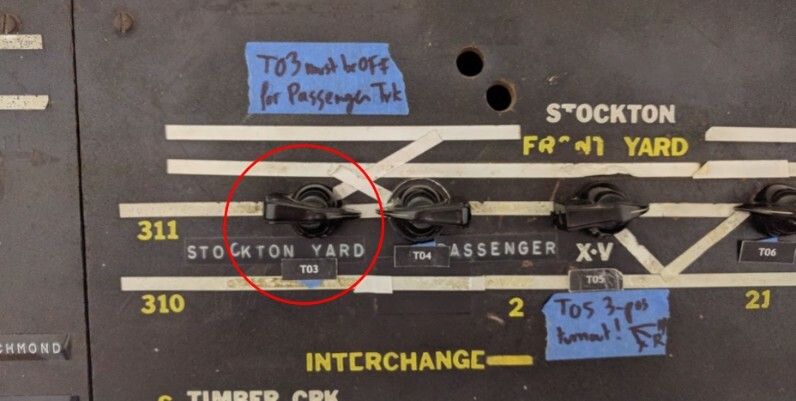 STN/YD is obviously Stockton Yard. ML/STN is Mainline / Stockton. “SLIP” track (or block?) seems to denote the special diamond/turnout of the T03/T04 4-way turnout. I looked at where the “W” power lead goes. 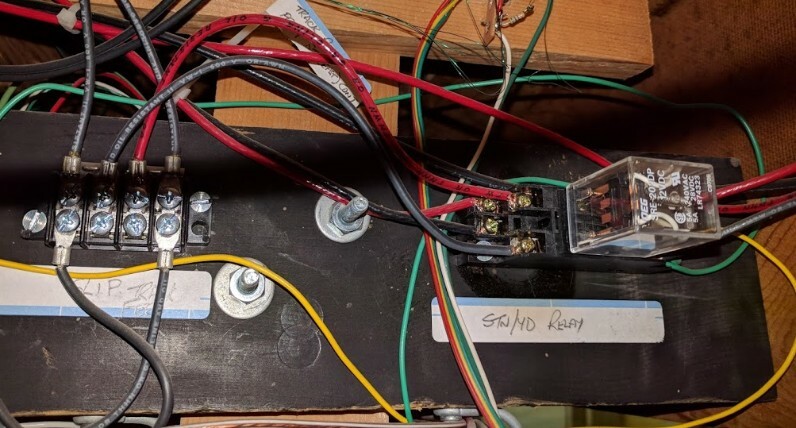 As expected, it leads to another relay somewhere under the Rodgers section of the layout..
At that point, it’s clear Mr. Perry spent quite some time designing and installing and wiring all the stuff. The question is why. What problem does this solve? How does it solve it? Due to the DC nature of the layout, a lot of the power management was obviously originally driven by the need to separate power districts and have interchange tracks with power source selectors -- in that case, the station can be powered by the mainline, the Stockton Yard, or the Roundhouse Lead on the East side, or from the mainline or SIA/Branchline on the West side, depending on whether the West or East access are used. And when using a DC throttle, it makes sense to properly power all the interexchange tracks. So maybe that’s one rationale here. Or maybe there’s something else going on. I’d really want to understand the purpose of all this before I make any changes to it (if any are needed at all). In the end, the objective is to make sure the station remained powered even when switching happens in the yard and the T03 turnout is used. The automation needs the station to be powered at all time -- otherwise the block sensors can’t identify the trains located there. Right now anyone switching in the Stockton Yard can render the automation inoperative just by setting T03 in reverse. The other thing to remember is that I did remove all the DC equipment. In DC mode, most of the layout was designed to power from a “cab 1” vs “cab 2” (and sometimes a local yard throttle), and the DCC has essentially been retrofitted to “cab 1” (I’m simplifying here). That leaves the other cab totally unpowered. 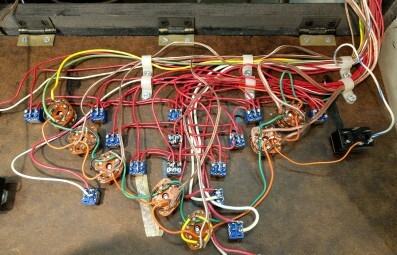 So one question is why not wire both cab 1 and cab 2 together, this way things would work seamlessly. That however seems a bit of a brute force technique, and one reason I want to avoid doing that is to inadvertently connect two or more boosters together (been there, done that). 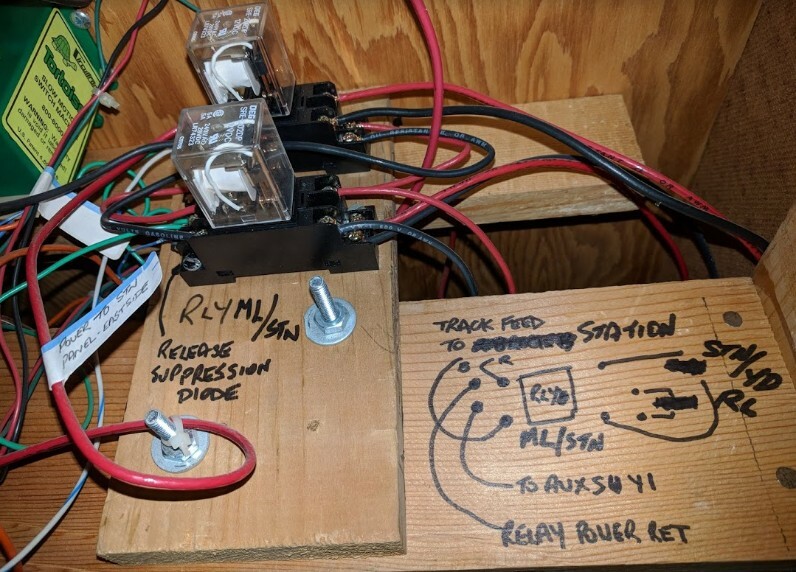 And that’s a concern here -- I could of course force the relays in a position that would power the track I want all the time, but doing so could also inadvertently bridge too circuits which are supposed to stay isolated. Instead my philosophy has been to try to understand the rationale behind the current setup when something doesn’t work as expected.